Tickets on Sale Wednesday, Oct. 17 at Noon ET/9:00 a.m. PT! 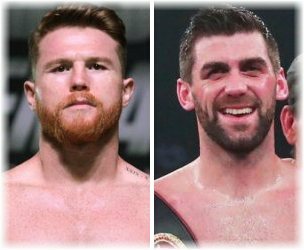 and Ring Magazine Middleweight World Champion Canelo Alvarez (50-1-2, 34 KOs) and WBA Super Middleweight World Champion Rocky Fielding (27-1, 15 KOs) will go on sale this Wednesday, Oct. 17 at Noon ET/9:00 a.m. PT. The special 12-round super middleweight attraction will take place Saturday, Dec. 15 at Madison Square Garden. Tickets for Canelo vs. Fielding go on sale Wednesday, Oct. 17 at Noon ET/9:00 a.m. PT. Tickets are priced at $1,000, $500, $300, $200, $150, $100, $75 and $50 plus applicable taxes, fees and services charges. Tickets can be purchased at the Madison Square Garden Box Office, all Ticketmaster outlets, Ticketmaster charge by phone (866-858-0008) and online at www.ticketmaster.com, www.goldenboytickets.com or www.MSG.com. Canelo, the 28-year-old native of Guadalajara, Jalisco, Mexico, is without a doubt boxing's biggest star. After his historic win against Gennady "GGG" Golovkin in their highly anticipated rematch in September, Canelo captured the WBC, WBA and Ring Magazine Middleweight World Titles to established himself as the very best fighter in the division. Canelo will look to capture a world title in a third division against Fielding. Fielding is a 31-year-old native of Liverpool, England who climbed the 168-pound rankings by fighting the toughest fighters in his native country. Fielding has only suffered one loss in his career, against who would eventually be a world champion in Callum Smith. Since then, he has scored six victories in a row, including his career-best win against Tyron Zeuge to capture the WBA Super Middleweight World Title in July. Fielding will defend his title in what will be his United States debut. Additional information for this event will be announced shortly. Title presented by Golden Boy Promotions in association with Matchroom Boxing. The event is sponsored by Tecate, "THE OFFICIAL BEER OF BOXING," and Hennessy "Never Stop. Never Settle." The event will take place Saturday, December 15 at Madison Square Garden in New York City, New York. @Canelo, @Rocky_Fielding and @MatchroomBoxing. Follow the conversation using #CaneloFielding.